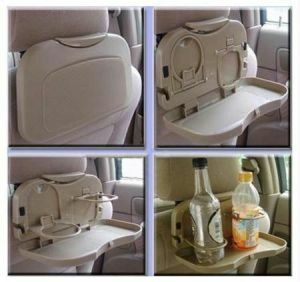 Car Multifunctional Tray/ Car Restaurant table/ Car Drink Holder. This Multifunctional Tray is used as a Car Restaurant table or a Car Drink Holder during the travelling. It can be used to place drinks, foods, and any small things you want. The tray also can be gathered when not be used. 100% New This Car Drink Holder is a very nice way to hold your favourite can, bottle, or cup. Contemporary design Automobile Meal Plate enhances interior. It holds cups, bottles or cans and your meal at the same time. Meal Plate Drink Holder featuring durable plastic construction. Long-distance drive good assistant. The car multifunctional tray is fund that it is easy install and use It is suitable for drink diameter up to 7.2cm. Product is imported from outside India.